I have been down and out for over a week with the flu. My husband succumbed a few days after I did so thanks to our good neighbors they made sure the livestock was taken care of. I must say if I have to be sick I am grateful for our view. 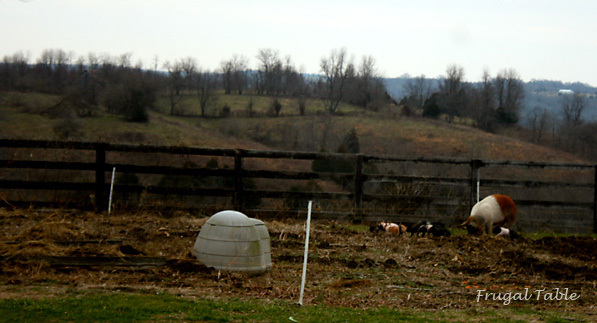 The piglets were very entertaining to watch while they were busy at turning over the garden! Saturday, I had rallied back enough to make bread and yogurt for the upcoming work week. 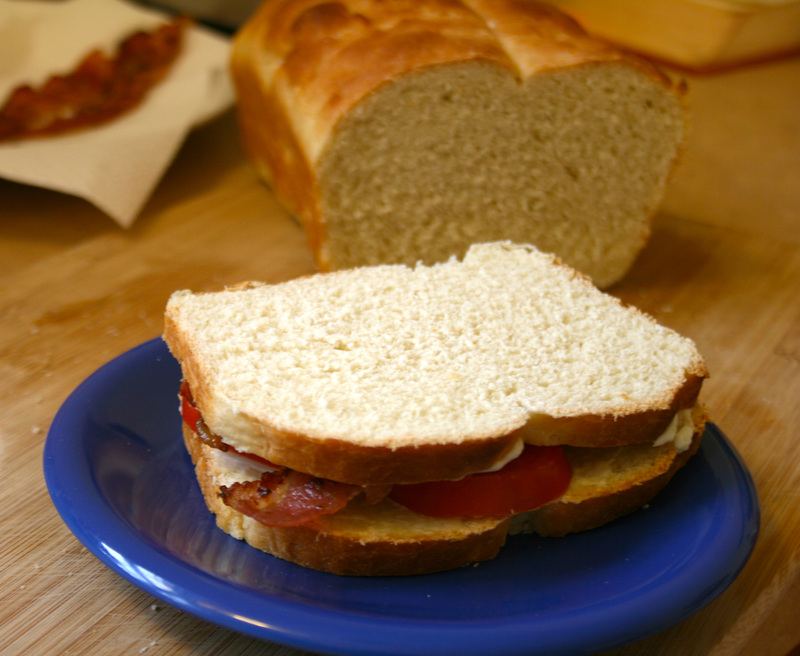 This recipe comes from an old Good Housekeeping cookbook and makes a good sandwich bread as it is heavy enough to stand up to thin slicing which is how we prefer our bread cut. The only changes I made was to use buttermilk instead of whole milk and to make half of the dough into a loaf and the other half into dinner rolls. I just take half of the dough and divide it into 10 sections or so. Roll into balls, they do not have to be perfect, and place in a greased cake pan. Bake along with the loaf but keep an eye on them as they may get done sooner. 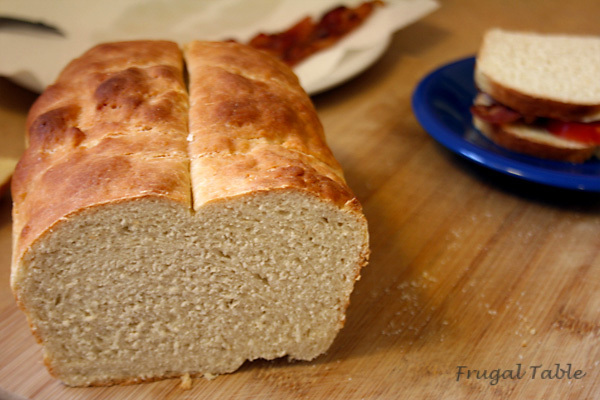 Tangy, chewy buttermilk bread. Slices great for sandwiches or warm with butter. Using a mixer at low speed, slowly add the heated milk mixture to flour mix until blended. Increase speed to medium and beat 2 minutes. Gradually add 1½ cups of flour, beat 2 more minutes. With a spoon, add in 4 cups of flour and blend. Turn dough out onto a floured surface and knead until smooth, about 10 minutes or so. (Mine never got totally smooth but I just went with it after 10 minutes and it was fine), Work in up to a ¼ cup more flour if needed while kneading. Smooth dough into a ball and place in a well greased bowl, turning the dough around to grease all of it's surface. Cover and place in a warm area until doubled. Takes about an hour. (I turn my oven on it's lowest setting, 170F. for about 10 minutes while I am mixing the dough. Then I turn it off and place the dough in it to rise). After the rise, punch the dough down. Place on lightly floured surface, cut in half and let rest for about 15 minutes. Shape each half into a loaf and place into a greased loaf pan. Cover, let rise again until about doubled. Heat oven to 400F. At this point, you can melt a bit of butter and brush the tops of the loaves. Bake for 30 to 35 minutes or until golden and test done. Remove loaves from pans and cool on wire rack. I used to have a frugal farm, and my son still has. I plan to read your blog regularly. You make me plan to start making bread again. I will try the buttermilk.